Maurissa Tancharoen and Jed Whedon say they’re happy about getting an order for two shorter seasons of Marvel’s Agents of S.H.I.E.L.D. from ABC. Whedon says a 22 episode season feels like a marathon while the shorter 13 episode order is much easier on the writers, the crew, and the cast. ABC’s order of a shorter seasons six and seven allowed for a break in between, a time to refresh and bring a renewed energy to the table. 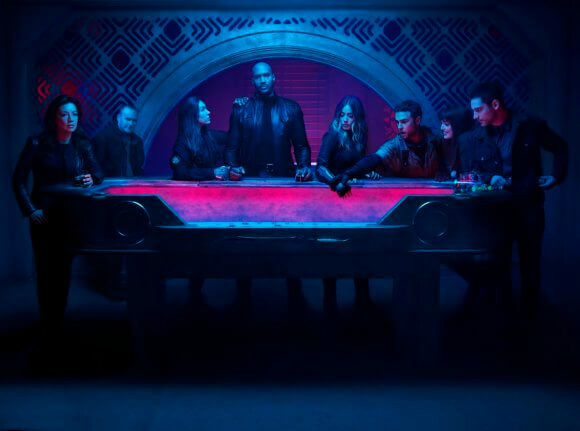 Filming is currently underway on season seven, and Whedon and Tancharoen admitted they had to try and remember what’s part of six and what’s part of season seven while discussing the upcoming return of Agents of S.H.I.E.L.D.. “There’s bound to be a spoiler that falls out of our mouths,” joked Tancharoen during our roundtable interview at WonderCon. Marvel’s Agents of S.H.I.E.L.D. season six will premiere on May 10, 2019. You split things up this season into earth crew and space crew. How much time do we spend in space compared to earth? Talbot at the end of season five was shot up into space. Will we see him floating around? Now that the Marvel Netflix characters are free will that affect who you cast or the characters in the show? Are you thinking about crossovers? What has been the strategy to how you filled out aspects of Clark’s new character? Are we going to see any old characters come back as instructors at the S.H.I.E.L.D. Academy or new characters as instructors? How would you describe Mack’s regime? What’s it going to look like? How is it different? Has the fact that you’ve been renewed for two seasons affected your writers room? Can you talk about Clark Gregg’s directing style?